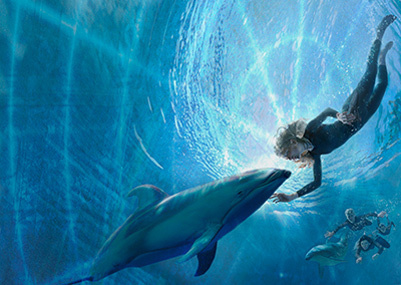 These are photographs of many of the amazing species Nere and her companions encounter in their new undersea world. 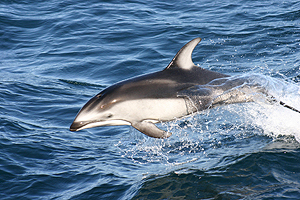 Check out dolphin sites and links to dolphin sounds. I did A LOT of research on dolphins and these are some of the coolest sites I came across. Make sure you click on the links to dolphin sounds. It's amazing all the wonderful noises dolphins make while they are echolocating and communicating with each other! Watch this colorful video to see what Nere's world beneath the waves looks like in the Channel Islands. Watch a live webcam of the Kelp Forest habitat at the Monterey Bay Aquarium. Research hundreds of individual plants and animals that call the California Coast their home. See how much you really know about kelp forest communities by completing this crossword puzzle. Learn to draw a life-like leopard shark using a collection of triangles and ovals. Way cool! Find out who gets wet first as the seas rise, or where NOT to buy beach front property! Actually, folks, ocean rise is no laughing matter, and it's happening around the world. Use the link below to see what happens to places like Venice and Florida if the oceans rise 5 meters. Use the map to travel to countries like the Netherlands and Bangladesh and see why these countries are already spending serious money trying to figure out how to protect their populations from the rising sea. Go back or forward in time to see how rising sea levels could impact Florida and the southeastern portion of the US. Global Ice Viewer—Select a topic to see how climate change will affect glaciers on 5 continents, ice sheets in Greenland, Arctic sea ice or Antarctic ice shelves. Discover how scientists track sea levels from satellites orbiting the globe and how lea level has changed over time. Click on the Sea Level Viewer to learn how warmer climate influences ocean temperature and causes sea level to rise. Scientists discuss the impact of the ocean's changing pH levels and inform us on what we can do to help reverse the trend. Here's a good animated video that explains acidification. Inside the Plastic Vortex—Even in one of the most desolate places on earth, human activity is having a major impact on North Pacific ecosystems. Learn about the problems the Great Pacific Garbage Patch creates in the environment, possible solutions, and what you can do to prevent more damage. By choosing just five of these simple ideas, and sharing your own, you can join thousands of others who are doing the same to create a healthy environment. If everyone does a little something every day, even the smallest effort will make a difference for wildlife and wild lands everywhere. How Much Do You Know About the Sea? 1. How much of the earth's surface is covered by oceans? The seas cover approximately 70.1 percent of the earth's surface, which means there's A LOT more of our planet is covered by ocean than by land. 2. Which mammal has the largest brain relative to the size of its body after us? 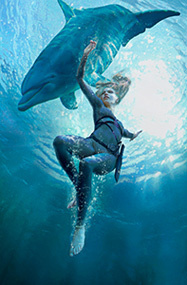 Dolphins have the highest ratio of brain to body size after us, which means there's a good reason why they're so smart! 3. What species of sea creature kills more people than any other? The box jellyfish or sea wasp is the deadliest creature in the seas, responsible for killing more people each year than all shark species combined. 4. What is the fastest shark in the sea? 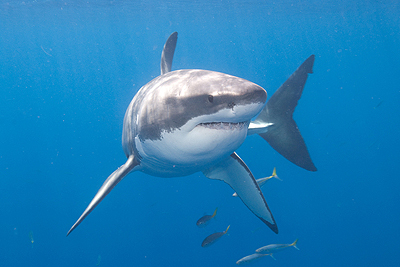 The shortfin mako is the fastest shark. It's been clocked at sustained speeds of 31 mph and short bursts of 46 mph. They can also leap 30 feet out of the water! 5. What sea plant is one of the fastest growing plants on earth? The giant Pacific kelp can grow up to eighteen inches a day! 6. Do marine phytoplankton or land plants take up more carbon dioxide (a major contributor to climate change)? Marine phytoplankton (microscopic plant-like organisms that float in the upper layers of the ocean) and land plants absorb approximately the same amount of carbon dioxide. Marine plants in general produce 70-80 percent of the oxygen in our atmosphere. So to keep our earth cool and healthy, saving the phytoplankton is just as important as saving our trees! 7. What sea creature eats sea sludge all day and can vomit up its own intestines as a defense mechanism? Sea cucumbers eat sea sludge and can vomit up some of their own organs to frighten away or distract predators. 8. What percent of the oceans have been explored by people so far? Only 5% of the oceans have been explored, which means there are still thousands of new places and species down there for YOU to discover someday!